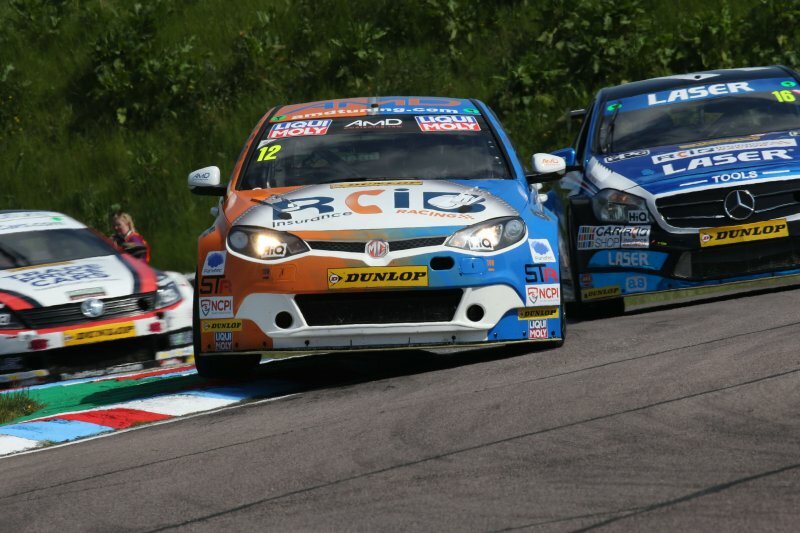 The AmD with AutoAid/RCIB Insurance Racing team was able to salvage a points finish from a tough weekend on track as the Dunlop MSA British Touring Car Championship headed for Thruxton for the third round of the year. The West Thurrock-based team headed to Hampshire in optimistic mood but was left on the back foot after a tough qualifying session at the quickest circuit on the calendar, although race day saw drivers Rory Butcher and Tom Boardman show the ongoing potential of the MG6 GT6. Despite a heavy crash in practice as a result of a tyre going down after hitting debris on track, Rory was able to make it out on track for qualifying and secured the 26th best time – despite being less than 1.5s away from pole. Overtaking would prove to be tough in the opening race of the weekend, with Rory crossing the line in 24th, but he was able to make more progress in race two as he battled his way into the top 20 within three laps. A sudden issue that caused the car to cut out on lap eight then undid his good work and dropped him back to 26th before a series of searing laps saw the Fife-racer fight back to 19th spot by the finish. In a position to push for points in race three, Rory was part of a train of cars running in the midfield throughout the 16 lap encounter and when the opportunity to break into the top 15 arrived with two laps to go, he was able to fight his way into 14th spot to score points for the third straight weekend. Team-mate Tom had been left on the back foot after qualifying in 31st place on the grid but the Forton-based driver was able to make forward progress when the lights went out in race one. Having climbed up six places, Tom was set to achieve his pre-race goal before heavy contact at the final chicane ripped a rear wheel from his car and forced him to retire. Left near the back of the grid for race two, Tom fought his way through to 22nd place despite not feeling at one with his car, with the team then making a number of set-up changes ahead of race three. Immediately more comfortable behind the wheel, Tom was quicker than he had been at any other time during the day as he fought his way to 18th spot, with the improved pace leaving him confident for the meetings to come. “It’s been a tough weekend for us after the accident in practice, which really put us on the back foot. The guys did a great job to get the car out for qualifying and the focus on race day was to try and bring home some points. “Like Rory it’s been a tough weekend. Qualifying was difficult and then race one was a disaster. There was no need for the contact that put me out and it left us with a lot of work to do to repair the car for race two. “We made a bit of progress in that race but I wasn’t really happy with the car and we made some pretty big changes for race three. All of a sudden, I felt a lot more comfortable and I think it showed in the performance. “It’s been the toughest weekend for us so far with the MGs but we’ve been around the BTCC long enough to know that you have to take the rough with the smooth. It’s unfortunate that both drivers were caught up in incidents that weren’t their fault but the guys in the team did a great job to ensure Rory and Tom were able to stay out on track having sustained pretty big damage. Picture again thanks to Marc Waller.